Now don’t get me wrong, I love Neil Diamond’s “Sweet Caroline” and Johnny Cougar’s little ditty ‘bout “Jack and Diane,” but when I’m inside Memorial Stadium watching the Hoosiers, there’s no other song I’d rather hear roaring over the speakers than Rich Gang’s “Tap Out.” No, it’s not because I have some great affinity for explicit rap music, but when it plays you know the Hoosiers’ defense has come up with a stop, forcing the opposing offense off the field. As I preview the Hoosiers’ 2015 defense, I’ll tell you why that song will be stuck in your head next fall. Rewind to January 10, 2014 when Coach Brian Knorr had just accepted an offer from the Air Force Academy. He thought he was headed back to Colorado Springs for his second coaching stint with the Falcons, but that was before Coach Kevin Wilson called him. Knorr’s new mission, should he choose to accept it, would be to oversee the reclamation of Indiana’s much maligned defense. Apparently it was an offer he couldn’t refuse, as the Hoosiers announced on January 20, 2014 that Knorr did indeed accept this monumental task vowing to remedy what had long been the program’s Achilles heel. "I think it's a great challenge," he told ESPN.com. It wasn't entirely clear whether Knorr was addressing the enormity of the task with that comment or just demonstrating his excitement for an opportunity with the Hoosiers. Back to present day, we see that although the transformation in year one wasn't quite as dramatic as the phoenix rising from its ashes, the Hoosiers improvement on defense was palpable and should have fans excited for 2015. Beyond playing with more confidence and grit, the Hoosiers held opponents to 95 fewer yards per game in 2014 (433) than they did in 2013 (528). Secondly, they did a better job of getting opponents off the field on third down, allowing opposing offenses to convert on only 36% of their third down attempts in 2014 compared to 47% in 2013. The Hoosiers also did a better job at forcing opponents into settling for field goal attempts in the red zone, allowing touchdowns on 60% of the opposing offenses’ trips to the red zone in 2014 compared to 69% in 2013. Most importantly, the defense reduced opponent’s scoring by two field goals or a touchdown a game to 32.8 in 2014 from 38.8 in 2013. While these statistics are an encouraging sign of progress, possibly even more exciting is who the Hoosiers have returning on the defensive side of the ball next fall. Below I’ll breakdown each position by identifying which key contributors are returning and which ones are moving on as well as predict who is likely to see the field for the Hoosiers next fall. With the arrival of Coach Knorr came the 3-4 defense that he utilized during his tenure at Wake Forest; for successful implementation of the defensive scheme the Hoosiers would need to find a versatile athlete to line up in its Bandit position. This player had to be strong enough to battle in the trenches while having the agility and speed to drop back in coverage. Inability to do both would spell trouble as opposing offenses could key in on the player’s tendencies, diminishing the element of surprise. The Hoosiers’ coaching staff found two such players on the roster that fit those specifications in defensive ends Nick Mangieri and Zach Shaw. They also added Robert McCray as part of the 2014 class to play in the role. Mangieri, who started all 12 games at bandit, performed well in the role recording 37 tackles, two sacks, and one interception. Shaw also provided solid play at the position collecting 24 tackles, 1.5 sacks, and recovering a fumble. McCray, who saw limited action in 10 games for the Hoosiers, will provide additional depth at the position. The 2015 class also includes a couple of talented prospects who could push for time at this critical spot. As their level of understanding and experience in the role increases, expect to see improved performance and increased production in 2015 from the players in the bandit position. After giving up nearly 238 yards on the ground per game in 2013, the Hoosiers saw their rush defense improve by 55 yards, allowing only 183 per game in 2014. This was largely a product of improved play along the defensive line. Not including the bandit position, the big guys up front generated 28% more tackles for loss in 2014 (32) than in 2013 (25). This is an encouraging sign as the Hoosiers are doing a better job of getting penetration and disrupting plays in the backfield. While they exhibited growth in defending the run, one area the defensive line must be more effective in is generating a pass rush. In recent history the Hoosiers’ defense has failed to create consistent pressure on the quarterback, often leading to big pass plays and untimely third down conversions. During Wilson’s tenure the Hoosiers have only once finished the season ranked top 50 nationally in sacks, which was in 2012 when their 27 sacks was good for 46th best. This task won’t get any easier with the graduation of the team’s sack leader Bobby Richardson, who had 5.5 in 2014. However, despite the loss of Richardson, defensive line play should continue to improve as it got contributions from multiple underclassmen in 2014. One of such contributors included redshirt freshman nose tackle Nate Hoff. A mostly unheralded late add to the 2013 recruiting class, Hoff started in 8 games and collected 8.5 tackles for loss for the Hoosiers. The Hoosiers also see the return of 4 other key contributors, Darius Latham, Ralph Green, Adarius Rayner, and Shawn Heffern. Redshirt sophomore Patrick Doughty and redshirt freshmen Michael Barwick, Derrian Meminger, and Nick Carovillano provide additional depth along the line and could press for time next fall. DT2 - Adarius Rayner – RS Sr. When the Hoosiers open up camp next fall, it will be without two of its starters at linebacker, David Cooper and Flo Hardin. 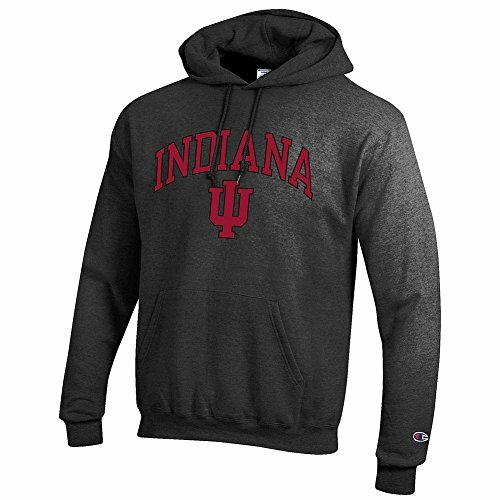 Cooper, an Atlanta native, had started in all 36 games in which he had appeared for the Hoosiers since arriving in Bloomington from Coffeyville Community College. The graduation of Cooper also brings with it the necessity of many of his Hoosier teammates finding a new place to get their haircut, as he also served as the team’s onsite barber. Hardin, the converted safety, played and started multiple games at outside linebacker during his final three seasons. 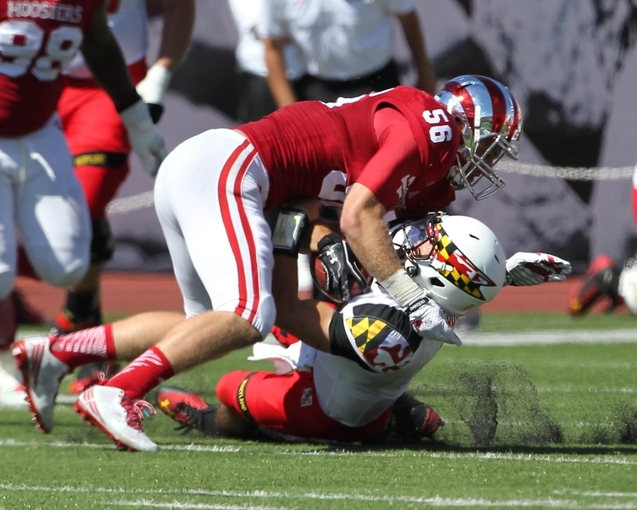 The Hoosiers also see the departure of reserve linebacker and special teamer Kyle Kennedy. Though the losses are considerable, the Hoosiers are thrilled about the future at the position. One player that had both Hoosier fans and coaches raving in 2014 was true freshman standout Tegray Scales. The former high school wrestling star‘s stellar play led to his inclusion on multiple Freshmen All-American and Freshman All-Big Ten teams. The scary part for the rest of the Big Ten is that Scales has yet to reap the benefits of offseason workouts with Indiana’s Strength and Conditioning Coach, Mark Hill. Starting alongside Scales at the other inside linebacker spot is two year starter T.J. Simmons. The Florida native Simmons was second on the team in tackles with 72 and led the team in forced fumbles with two. Providing depth at inside linebacker are Marcus Oliver, Greg Gooch, and Nile Sykes. Oliver, who is often described as a very cerebral player, will be returning for his third season after a knee injury cut his sophomore campaign short. Gooch, the Hoosiers’ largest linebacker at 6’2’’ and 249 lbs, saw action in all 12 games during his true freshman season and was named the Hoosiers’ defensive player of the week against Penn State. Finally, Sykes is another interesting prospect that should make an impact this fall after redshirting his first season on campus. Last summer the former Notre Dame commit was granted a full release from his agreement with the Irish and joined the Hoosiers football program on July 4, 2014. Outside Linebacker appears to be the position that is most up for grabs among the three linebacker spots. The Hoosiers could turn to Junior to be Clyde Newton to start. As a freshman Newton started in four games and played well, however, his playing time was considerably reduced during his sophomore campaign. Another option includes redshirt freshman Dameon Willis. The Cleveland native brings a good combination of size and speed, capable of playing the run while being able to drop into coverage on passing downs. Regardless of who gets the nod to start, the Hoosiers will have the luxury of rotating between six to seven very talented athletes at linebacker. The position on defense that likely registers the greatest level of concern for the coaching staff is at cornerback. Not only will the Hoosiers need to replace senior Tim Bennett, the nation’s leader in pass break ups during the 2013 season, but also redshirt junior Michael Hunter, who dealt an unexpected blow to the position when he announced he would not be returning for his final season of eligibility. Hunter’s stellar play down the stretch made his decision not to return that much tougher to swallow. Over the second half of the season the Louisiana native had emerged as a playmaker, recording an interception and 3 pass break ups over the Hoosiers final 3 games. Thankfully, it’s not all gloom and doom for the Hoosiers at cornerback. Redshirt freshman Rashard Fant and true freshman Donovan Clark were able to get valuable playing experience during the season as Cornerbacks Coach Brandon Shelby frequently rotated his guys to keep them fresh. Kenny Mullen, who will be returning for his fifth year after going down with injury in the team’s upset win over Missouri, will provide veteran leadership and experienced depth at the position. The team’s other two options at cornerback include redshirt sophomores Noel Padmore and Laray Smith, both who played sparingly on special teams. Smith, a four time high school All-American sprinter from New York, was moved to cornerback from running back last fall. His speed and six foot frame makes him an attractive option at the position as wide receivers continue to increase in size. This is one position that could see a shake up once the 2015 class arrives on campus. While safety sees the graduation of 3 year starter and Capital One Academic All-American Mark Murphy, Coach Noah Joseph has to be happy with the talent he has to work with in 2015. The Hoosiers return a youthful but experienced group led by Junior Antonio Allen and Redshirt Sophomore Chase Dutra. Allen, who had a team leading 74 tackles in 2014, is an explosive hitter who excels in run support. While not his strong suit, he’s also shown that he is capable in coverage as evidenced by his two interceptions against JT Barrett and the Buckeyes. Dutra, the rangy athlete from Brownsburg, is strong in pass coverage and great at making plays on the ball. He finished the season with three picks, which tied for most on the team. The combination of Allen’s hard hitting run support and Dutra’s ability in coverage make for perfect complements to start on the backend of the Hoosiers’ defense. A talented quartet from the 2014 class including Tony Fields, Kiante Walton, Will Dawkins, and Zeke Walker provide quality depth at the position. Both Fields and Walton saw playing time in their first semester on campus, while Dawkins and Walker took redshirts. Fields gives the Hoosiers another hard hitting option at safety while Dawkins showed ball hawking ability in his high schools highlights. Walton, originally at cornerback, could return to that position if the Hoosiers deem they need additional depth at the spot. Finally, Walker is a large, versatile athlete who served as the emergency third string quarterback after the Hoosiers suffered multiple injuries at the position in 2014. Due to the Hoosiers propensity to rotate players, don’t be surprised to see all of these guys on the field at some point next fall. As the Hoosiers enter year two under Co-Defensive Coordinator Coach Knorr, expect an even greater leap in play and production by the defense as they grow more comfortable in the team’s 3-4 scheme. With the return of multiple starters, development of underclassmen, and the inclusion of the 2014 redshirt freshmen and 2015 true freshmen, all signs point toward fewer ditties ‘bout “Jack and Diane” and more of Rich Gang’s “Tap Out” blaring over the speakers next fall.